Some veterans groups are calling on state and federal officials to recognize the benefits of legal marijuana as a treatment for chronic pain and PTSD. A recent decision by Colorado’s Board of Health, to not include Post Traumatic Stress Disorder (PTSD) to its list of debilitating conditions that can be treated with medical marijuana, has become a rallying cry for military veterans groups. 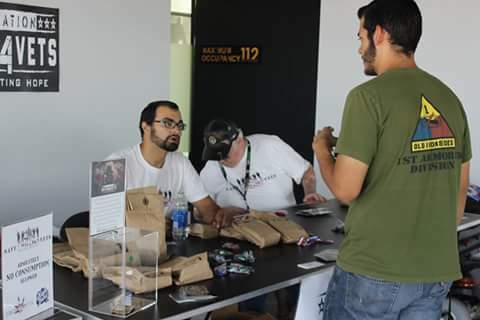 In response to Colorado’s decision regarding PTSD treatment, the organization Grow For Vets recently distributed free cannabis products to hundreds of veterans in Denver. The group was founded in January of 2014, soon after Colorado legalized the recreational, adult use of cannabis. And it believes cannabis can be a safer and more comprehensive way to treat PTSD in veterans; and to reduce the number of veterans who die daily from suicide and prescription drug overdose. “We believe that our veterans have earned the right to receive the most effective medical treatment available,” says the organization’s web site – which also takes to task how healthcare companies constantly go to pharmaceuticals as the preferred treatment for both chronic pain and emotional or mental issues. David Serrano, president of the Grow For Vets Colorado chapter, knows the drill. A Navy veteran, Serrano dislocated his shoulder while in the service and ended up having four surgeries – which led to a series of prescriptions for increasingly stronger drugs. Serrano believes there’s a generational resistance among older VA officials to considering marijuana as a treatment for PTSD -- and he recalls how he was screamed out of an examining room by a VA doctor for bringing up the possibility of using marijuana as a medical treatment. Serrano says veterans with PTSD and other issues need to know they can reach out to groups like Grow Four Vets.